SAIDIA partners with Samburu County in a program in a program that places more than 1,000 orphaned and abandoned children in caregiver households. SAIDIA provides counselling for the children and monitors their health and education needs. Caregivers are given chickens and vegetable seeds to provide food for the children. The program is partly funded by PEPFAR through USAID. Susan Lepalo, a caregiver from Wamba, looks after two children. 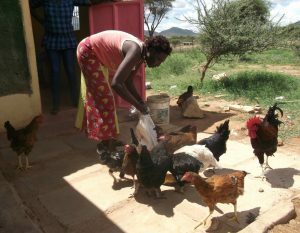 She grew her initial donation of 5 chicks into a thriving poultry business with more than 40 birds in just one year. With the profits from the eggs she sells at the local market, she is able to pay for the children’s school requirements as well as their clothes and food. comfortably takes care of her 2 OVC and herself. She is a good example of a caregiver can improve her earning and live a comfortable live even if donors stop their support. Quality Improvement Teams are responsible for the needs of the children in their location are taken care of. One particular concern is the nutrition requirements of children who have been infected at birth with HIV. 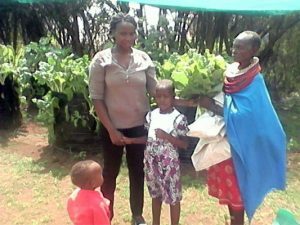 The Wamba Quality Improvement Team started a vegetable garden which supplies households caring for HIV children with kale. Children benefiting from this program show no signs of malnutrition and their health and weight is normal. Esther has cerebral palsy and was lying on old cloths and cardboard when SAIDIA first met her. SAIDIA Department of Social Services which provided her with a wheelchair. Now Esther is comfortable and gives friends a big smile from her new vantage point of the world around her.